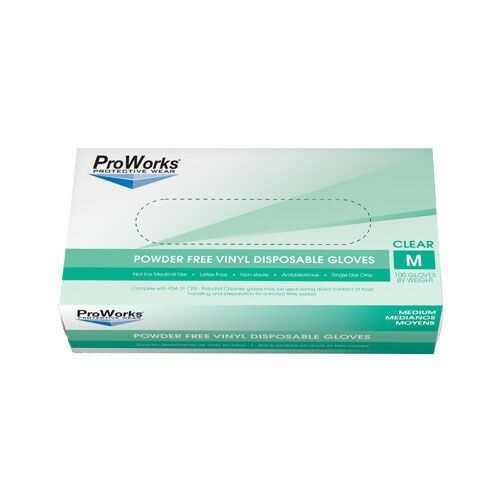 Hospeco ProWorks Vinyl Clear Powder Free Gloves are designed for general protection. Hospeco ProWorks Gloves are latex-free, which makes them a perfect alternative for those with latex allergies. These gloves are made from 3-mil thick industrial-grade material and feature a beaded cuff. These disposable gloves are designed for single use. They are clear, powder free, and meet the FDA CFR Title 21 Indirect Food Additive Regulations Part 174-178. Hospeco manufactures a wide variety of exam gloves, you may also like the ProWorks Latex Exam Grade Powder-Free Gloves and the ProWorks Black Nitrile Powder-Free Gloves, on sale at Vitality Medical.